Reliance Foundry’s line of bike bollards provide secure bicycle storage while minimizing obstruction caused by improper bike parking. Bike bollards can be securely installed on a mixed or non-concrete surface by using anchor castings placed in concrete forms. It is important to note that with this installation method, bike bollards will provide limited impact resistance. To protect the finish, keep bollards in original packaging until the exact moment of installation. Handle with care to avoid scratching or damaging bollard surfaces as abrasions will lead to rust. Once scratched, bollards cannot be repaired to original form without re-finishing the entire surface. Refer to site plans to locate the precise center point of each bike bollard. Ensure that the plan coincides with the site and familiarize yourself with the intended arrangement of the bike bollards. Always check for hazards such as water pipes, gas lines, and underground wiring before digging. Please consult your local Building Code Department to determine the recommended digging depth below the frost line in your area. The new concrete footing must reach this recommended digging depth. Note: If the recommended digging depth is less than 12″ below surface level, dig to a minimum depth of 12″. This is recommended in order to create stability. Tubing must have a diameter that is equal to or larger than that of the bike bollard base. Cut the tubed concrete form to the correct length so that when placed in the prepared site, its top will be flush with the finished surface. Note: It is crucial to leave an allowance at the top of the current surface as the landscaping material must still be added later. Consult with your landscaper to determine how much allowance is required. Ensure that the diameter of the hole is large enough to hold the tubing. 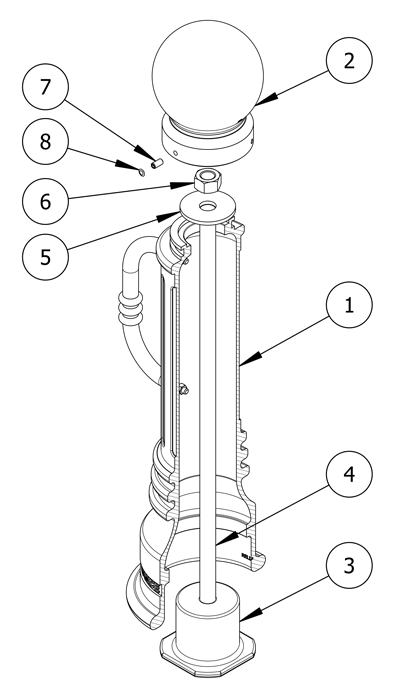 Center an auger on the installation mark and bore a hole to required measurements. Measure 4″ down from the top of the tube and mark on the inside. This marks the embedment depth for the anchor casting. Place the concrete form in the designated position. Ensure center of tubed form lines up with center point markings. Use dirt or gravel to fill in any voids between the concrete form and the hole. Ensure that the proper ratio of water and concrete mix is used. The concrete should have a similar texture to moldable clay. Pour the concrete into the concrete form until it reaches the previously marked embedment marking on the inside of the tubing. Take care to pour the concrete evenly and avoid disrupting the concrete form. Cover the bottom hole of the anchor casting with duct tape to prevent debris from entering. The top hole should already be covered with the plug (A). Lower the anchor casting into the concrete form. The top of the anchor casting should be flush with the top of the concrete form and the intended finished surface. Continue to pour the concrete until the concrete form is filled to the top. A minimum of 2–3 days should be given for concrete to cure before beginning construction projects on new concrete surfaces. Once the concrete has fully cured, landscaping materials such as dirt, sand, and brick can be applied around the concrete form. Keep the bike bollard in its protective packaging. After ensuring the concrete surface has fully cured, carefully place the bike bollard beside the anchor casting. When ready to install, remove the bike bollard’s protective packaging. 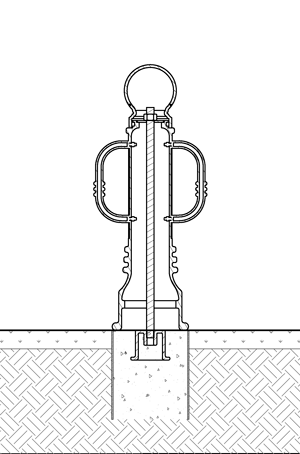 Remove the plug (A) from the top hole of the anchor casting. Set the bike bollard base upright and maneuver it so the center lines up with the threaded hole in the anchor casting. Lower the threaded rod through the bike bollard base. Continue to thread the rod into the anchor casting. Tighten* the threaded rod by hand until it is secure in the anchor casting. Place the washer over the threaded rod so that it rests on top of the shaft of the bike bollard. Apply the 1″ nut to the threaded rod and use a wrench to tighten until the bike bollard is secure. Note: Be sure to check the orientation of the bike bollard arms before securing the bike bollard. Remove the bike bollard cap from its packaging. Place the cap on the top of the shaft of the bike bollard. Secure and align the cap to the bike bollard base with the three set screws. Tighten in equal amounts to ensure that the cap remains centered. Place the plastic plugs (B) over the set screws. Ensure the bike bollard is plumb. Bike bollards can be installed using concrete forms and anchor castings.